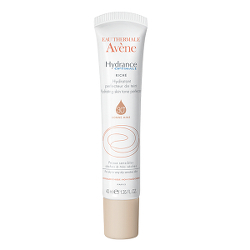 Samenstelling: AVENE AQUA. OCTYLDODECANOL. DICAPRYLYL ETHER. COCO-CAPRYLATE. DIMETHICONE. TITANIUM DIOXIDE (NANO). POLYMETHYL METHACRYLATE. DICAPRYLYL CARBONATE. GLYCERIN. ETHYLHEXYL SALICYLATE. PEG-30 DIPOLYHYDROXYSTEARATE. CI 77891. BUTYL METHOXYDIBENZOYLMETHANE. BIS-ETHYLHEXYL HYDROXYDIMETHOXY BENZYLMALONATE. DISTEARDIMONIUM HECTORITE. C30-45 ALKYL METHICONE. BENZOIC ACID. BETA-SITOSTEROL. C30-45 OLEFIN. CAPRYLIC/CAPRIC TRIGLYCERIDE. CAPRYLYL GLYCOL. CARTHAMUS TINCTORIUS SEED OIL. DIMETHICONE CROSSPOLYMER. DISODIUM EDTA. PARFUM. GLYCINE SOJA SEED EXTRACT. HELIANTHUS ANNUUS SEED OIL. HYDROGENATED COCO-GLYCERIDES. HYDROGENATED STARCH HYDROLYSATE. CI 77492. CI 77491. CI 77499. LECITHIN. MICA. PEG-32. PEG-400. POLOXAMER 188. SILICA. SODIUM CHLORIDE. SODIUM CHONDROITIN SULFATE. SODIUM MYRISTOYL GLUTAMATE. TALC. TOCOPHEROL. TOCOPHERYL GLUCOSIDE. AQUA.